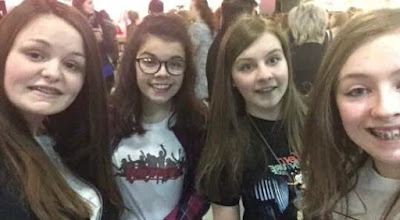 I’m taking you ‘back in time’ to the 16th March, where my three friends and I got the chance to see McBusted on their 2015 tour. From the moment they appeared and start bouncing on stage to the sounds of Air Guitar the scene was set for an adrenaline filled night which definitely brightened up a Monday night. We got there just before doors opening, getting ready to enter the arena and running straight the official tour merchandise stands to avoid long queues. Throughout the four of us we managed to buy a little too much, but it was worth it. Soon after, we got to our seats and had a great warm up by the support act New City Kings and Symmetry. Next up was the one and only super group that we came to see, McBusted! To start the set was amazing as they told us it was a giant, full functioning, arcade which they played a mini game on mid-way through their set list.I have to say their trademark synchronized jumps, kicks were all to their best as well as their polished vocals. The boys attacked the stage with a loud, outgoing personality’s attitude, if to remind their audience that they are still in best band just like when they were younger. The show kicked in when the six all join together for classic originals from both McFly and Busted like Air Hostess, Crashed the Wedding, Obviously and Five Colours In Her Hair. They had us all bouncing around and chanting along which got us extremely hyped. The boys smashed their new songs from their album McBusted (how creative) such as Air Guitar and Hate Your Guts which were super fun and energetic. Flames, sparks and t-shirt canons added to the extra fun and let’s not forget James ‘riding on his bike’ for an entire song. This has been the most fun, light hearted concert I’ve been to, their comedy and jokes were always a laugh for the audience, Dougie will not be forgiven for calling us Glasgow instead of Newcastle frequently throughout the performance. It wasn’t until they began Beautiful Girls Are the Loneliest when the entire arena was practically in tears and had their flashlights on swaying side to side. Sadly the night had to draw to an end it was needless to say that we were all in tears to see our favourites close with Year 3000. This concert was lively, energetic and enthusiastic and showed a true bond of the six of them coming together of two separate bands and joining as one super group and fresh new band.